GERMAN firm Sachs and British company CCM are in talks aimed at teaming up to buy Suzuki TL V-twin engines. CCM refuses to confirm it, but an insider at Sachs said: " It helps if we work together. Now a new project has arrived, and a new engine, and we should be working together again. " 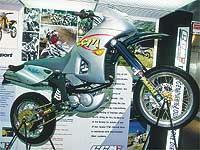 The rumour fuels speculation that CCM is once again looking at a V-twin supermoto or trail bike. The previous prototype used the now unavailable Folan twin and raised more than a few eyebrows when it was unveiled at the Munich bike show in 1998.